There’s no country like Qatar.. ok except maybe the UAE, Bahrain or Kuwait. But what sets Qatar apart from those places is that it’s mega rich (as opposed to super rich like the other three). Whilst the Emirates and Kuwait have oil reserves that will eventually run out. Qatar instead has natural gas in an amount that as been described as “virtually unlimited”. As the world’s demands for natural gas increases so to does Qatar’s wealth. So much so, that the government lliterally dishes out money to it’s citizens. You can expect a free block of land from the government when you get married and a very cheap loan to have your mansion built on it. There’s also no need to worry about paying for utilities, as there’s no such thing as a water or power bill, and that hospital down the road is likely kitted out with the most advanced gear and you will never have to pay a cent if you need to use it. All part of the service of living in a country with the highest income per capita in the world. Waking up on a Friday morning after a late Thursday night flight I was quick to discover that Friday is not your typical day as we know it the rest of the western world. Friday morning is reserved for prayers so all the shops were closed (my stomach still grumbles). Once the prayers are over and the shops are open, the rest of the day at the shops is reserved for families. Being a single man, I was not supposed to go to the shops, but I went anyway to a smaller mall near my hotel and this didn’t appear to be a problem. However I’m ensured if I went to one of the larger ones then I would’ve been turned away. (Sad but true). Las Vegas comes to mind. 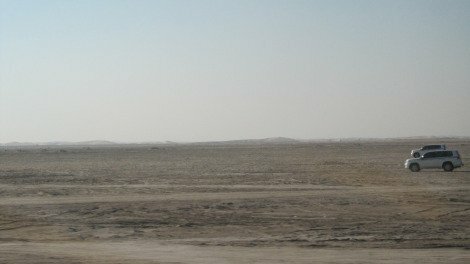 It’s in the desert, there are big wide roads cutting through the city, and traffic driving along them is mostly made up for big american SUV’s and pick-ups such as Escalades and Dodge Rams. The avenues are flanked by big glittery new hotels as well as every American fast food chain you can imagine and more. I’m not just talking your typical McDonalds or KFC here. There were restaurants that I had not even seen outside of America such as Arby’s, Dairy Queen, Hardee’s and more. With a country that’s 99% sand dunes, grabbing a 4WD and heading out to smash some up sounds like a great idea. It also appears to be one of the national past times of Qatar. To get to the dunes I booked a tour with a a 4WD driver, he picked me up right form the hotel and we headed south down a new looking freeway This new freeway had speed cameras installed in an effort to help kerb the horrendous annual road toll. (Google or YouTube Qatari driving and you’ll get the idea). This did not sit well with many of the local drivers who simply drove along the sand on the side of the road (also at over 100kph) to avoid getting caught by the speed cameras. It’s not marked, but here we are driving in the unofficial middle lane. I think we crossed on to the wrong side of the road at least 4 times on this trip, and waved many times to kids wrestling each other on the shelf above the back seats of cars. There appears to be no word of safety in the Qatari dialect of the Arabic language. Dune Bashing was actually pretty cool, like a rollar coaster on sand. But perhaps the best part of the trip was coming across the inland see to sea it full of Flamingos. I had no idea that there were flamingos in this part of the world, yet along a flock of them. These flamingos were actually relaxing in an area between Qatar and Saudi Arabia, an area where a human would not feel so relaxed. 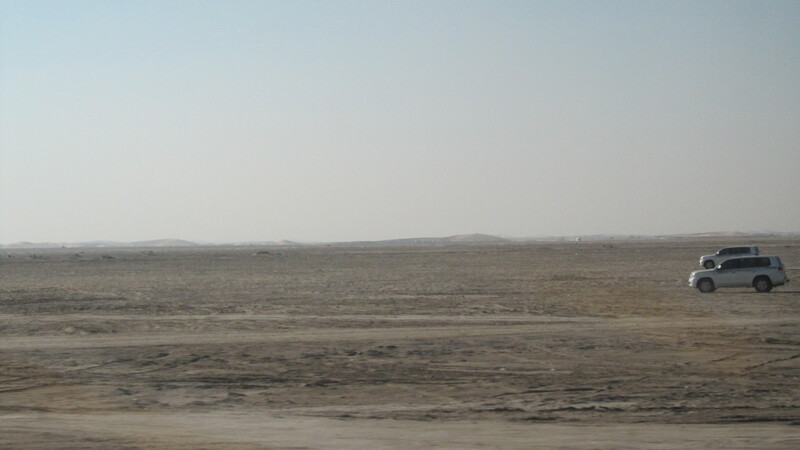 Qataris are concerned that Saudi will one day invade their small peninsular to claim their gas reserves, and as such it was common to have the sandy landscape interrupted by small military look out posts. Dropping tire pressure before hitting the dunes. 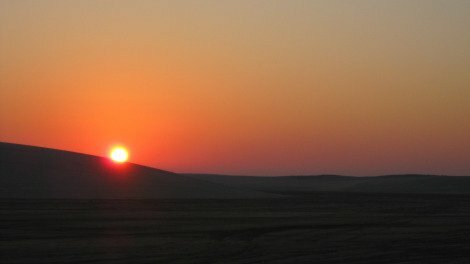 Perhaps one of the best parts about being in the desert was the surreal desert sun sets, and the shadows that the low sun casts across the tunes. 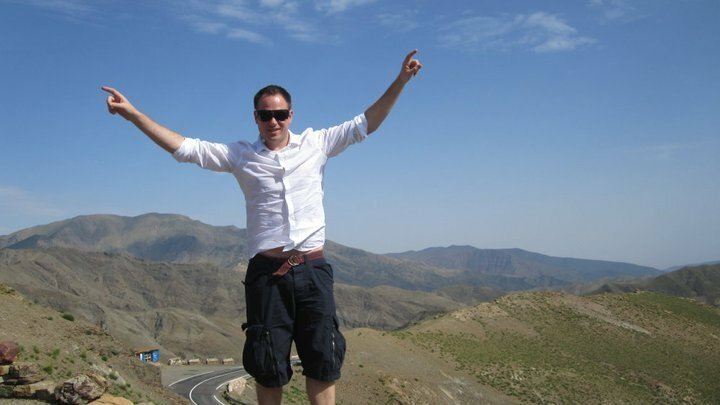 Also impressive was how the guide made it back to civilisation in the dark without any roads or street lights to indicate the way to go. Even more impressive when you consider this landscape is in constant flux with the wind shifting the location of the dunes. If I’m honest Doha is not a place to come to party. The conservative state means that the opportunity to drink alcohol is limited 4 star and above hotels, as well as some golf clubs. Luckily my hotel was more than 4 star, and happened to have one of the more infamous night clubs just a short lift ride downstairs. 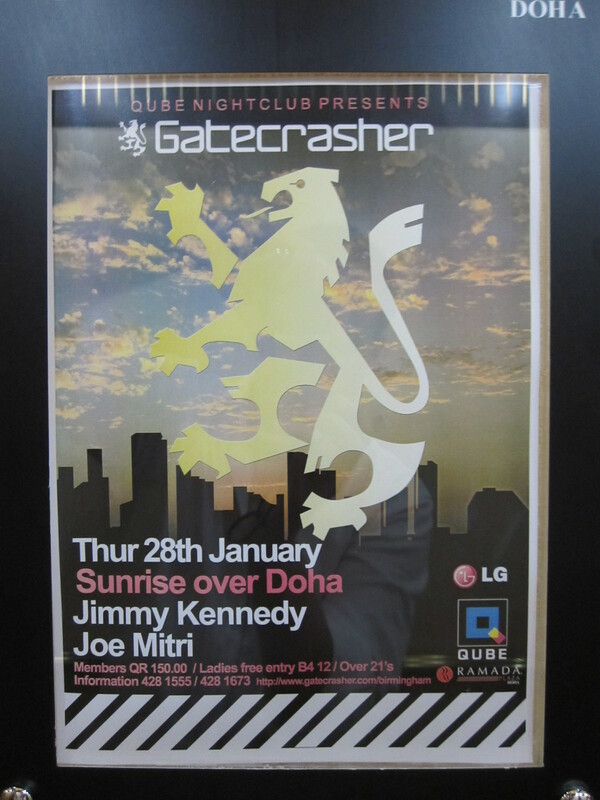 Qube touts itself as one of the premier night spots in Qatar. But in actually fact I would say it is one of the more trashiest, and on-par with what you would find at your local suburban night club but with a few key differences. 1. If you are not staying at the hotel you need to be a member. This basically means that you officially have permission to drink alcohol, and prepare to bring a stack load of identification / documentation to get your membership. If you are are staying at the hotel no need to worry. 2. There is a couples and ladies only section. This was something I discovered by accident when trying to walk up the stairs into this area I was repeatedly denied entry. It took me awhile to realise why I wasn’t allowed up there. Sexual segregation was not something I was expecting to find in a night club. 3. Prostitutes are everywhere. Ok I shouldn’t be making such big claims because prostitution is highly illegal in Qatar. But if there is a cute Filipino girl smiling at you, and she’s much hotter than the girls that usually smile at you, then let’s assume that she really wants what’s in your wallet more than she wants you. Apart form this, I don’t have too many impressions of this place. It’s just a night club really, see for yourself form the images below. 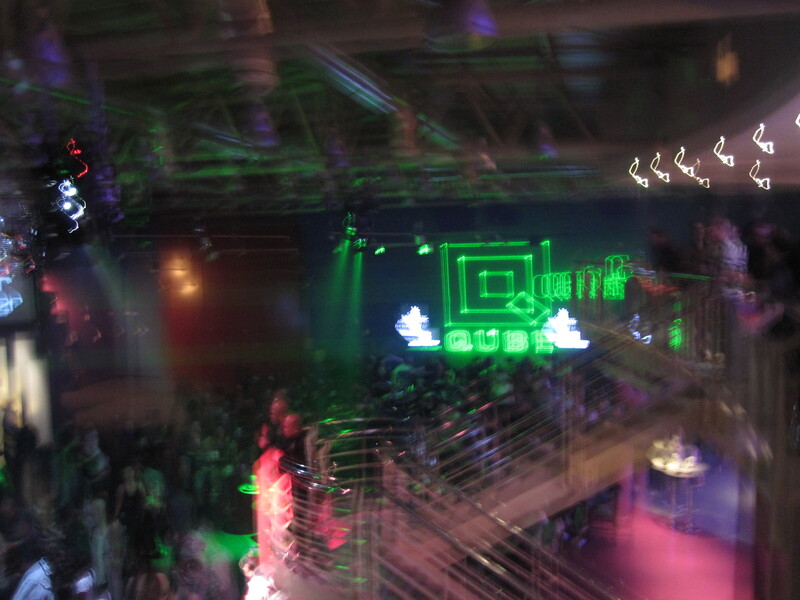 Best photo of Qube I have, but really you’re not missing out on anything. Overseas nightclub brands often visit with DJ’s you’ve never heard of. If you are looking to party, then you can have a very premium top-shelf experience at places like the Sky View roof-top bar at the La Cigale Hotel, or watch the young locals turn up in their Ferraris’ and Lamborghini’s at Pearl Lounge (Marriot) or the Admiral Club (Ritz Carlton). 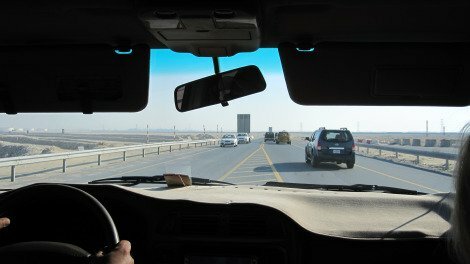 Continued in part 2 with Doha Limo Tour, Camel Market and Indoor Gondola Rides. 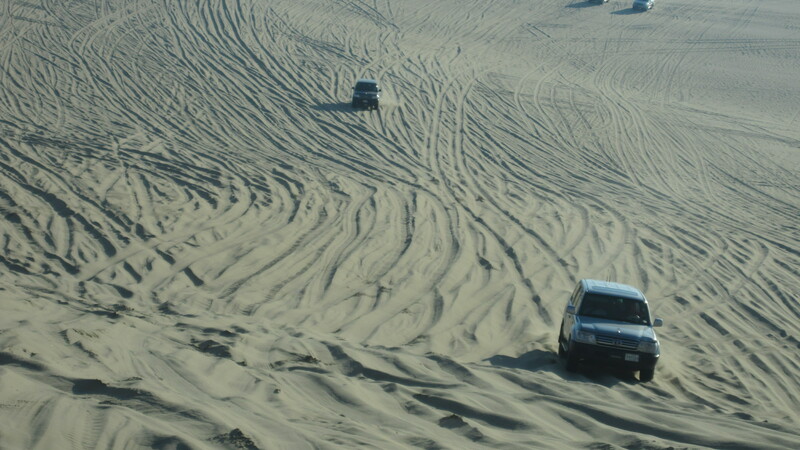 This entry was posted in Alone In..., Asia, Travel and tagged 4wd, arabia, doha, nightclub, qatar, sand dunes, travel. Bookmark the permalink.